One thing I’ve always enjoyed about the story of Raistlin’s Daughter is the air of mystery it evokes. Does Raistlin have a daughter? What does she look like? Is she powerful in magic, being part irda and the child of the great Raistlin Majere? Personally, I felt let down with Usha. I was expecting the legend to be revealed only to have it turn into a charlatan and the legend proved to be false, at least where Usha is concerned. I would have rather kept the mystery, or have an actual daughter appear. Needless to say, Usha is not one of my favorite characters. In the case of what you believe, whether Raistlin had a daughter or not, I believe that it is up to the individual reader to decide. No matter what any company, author, game designer, etc. has to say on the subject, the reader inevitably decides what he holds to be true. That being said, an author, game designer, etc. can give some insight into a character and even reveal how the company views continuity in this case. Margaret has said that Raistlin’s Daughter is an urban legend. You can bet, since she is an advisor to the book department, that this is what WotC holds to be true. The reader, then, has to decide what they hold as truth. Does the reader stick with only what is in print? If that’s the case, rejoice, for the kodragon lives! Nothing in print has denied its existence. Does the reader take into consideration what the authors, game designers, etc. have to say on the issue? If that’s the case, rejoice, for it has been stated that those annoying kodragons are no longer part of continuity! Another question along similar lines is whether Lord Soth went to Ravenloft or not. Margaret and Tracy’s opinion is that he didn’t, yet it’s in print that he did. Who do you believe? Each one of us has a different opinion on questions such as these. There is no right or wrong, and I feel it isn’t right for any one of us to push our views on others either way (though friendly discussion is always cool). In my own world view, Raistlin had a daughter, kodragons exist, and Lord Soth went to Ravenloft and came back just in time for Dragons of Summer Flame. You may feel that Raistlin’s Daughter is an urban legend, kodragons should be put through a meat grinder, and Lord Soth was actually in Bermuda. 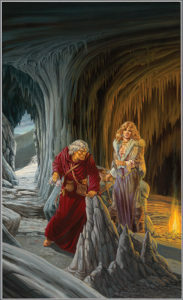 Whatever the case, it is okay, as the world of Dragonlance is big enough for all our points of view. « High Sorcerers and Low Sorcerers? I agree, in that I believe that the incident happened and there is/was a child of Raistlin Majere in the world. Is this child still alive? That was a long time ago and many dangerous things have happened to the world at large and any number of incidents could have happened to an individual at any point. Does it have to be a daughter? I haven’t read this story in years so I don’t remember if it stated specifically that the child born to the Irda was a daughter. If you want to use this legend in your own stories, it could be a daughter or a son. What has this child been doing and where has it been for all these years? Now THAT would be an interesting story, for sure. What kind of travels and adventures could this child have had over the past 6-7 decades. He is my leader and my first loyalty is to my friends.